Thank you Big Brothers and Big Sister of Green County for being our Surprise Cookie Patrol Chamber Member of The Month. January Is National Mentoring Month, We thought this was a great way to honor what they do all year. 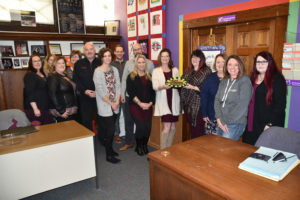 They are dedicated to connecting children and families to great volunteers that want to help build a stronger future. Stop into the office at 1505 9th Street to get your name. Put in the Cookie Jar. Learn more about volunteer opportunities while you are there. Shannon Kaszuba and Kirsten Boll were great sports to host our group.